Patrick Stewart (b. December 1565 – d. 6 February 1615, Edinburgh) was by title the 2nd Earl of Orkney and Lord of Zetland, serving from 1591 until he was executed in 1615. He was the son of Earl Robert Stewart. 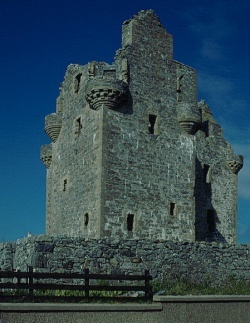 He ordered the construction of the Scalloway Castle, which still stands today as a ruin in the village of Scalloway. Earl Patrick inherited the title of Earl of Orkney and Lord of Zetland from his father, Robert, a few years before his death. Earl Patrick's reputation became even worse than his father's, and his tyranny over the northern isles became part of folklore; his nicknames Black Pate Stewart or Black Patie became synonyms for oppression. His extravagant lifestyle – exemplified in the magnificent castles of Scalloway (1599) and Kirkwall (1607) – had to be financed by his subjects in Orkney and Shetland. 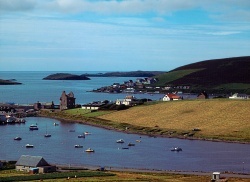 Scalloway Castle as seen in 1989. Though his crimes are well documented and undeniable, Earl Patrick's history was written by his enemies and only tells part of the story. Despite his treacherous reign over the peasantry of Shetland, his reign was a period of prosperity for the Isles. He encouraged foreign fisherman to fish in his waters: he also had his ships directed to sea to intercept pirates and collect tribute of foreign fishers that came yearly to these seas.- Historie and Life of King James the Sext. He levied tributes on the industry of others, in particular on that of the foreign fishermen and merchants, but his Shetland property – much the same at his death as he had inherited – he managed carefully, and the payments he collected from it were strictly in accordance with tradition. In 1606 Earl Patrick ignored a summons that requested he appear before the Privy Council to explain the complaints received regarding his extremely oppressive rule – not for the first time nor for the last. He was even charged with treason, but the charge was dropped in 1607. In the same year James Law was appointed as Bishop of Orkney. Law presented a petition to King James VI about Patrick's oppressions. In 1610 Earl Patrick was indicted on seven charges of treason, on the ground of usurping royal authority. He remained in Edinburgh Castle, despite pleading justification for his actions from the islands' laws. While in prison he had to face further charges including the exaction of taxes from Dutch and English fishing vessels, and the accusation that he had forbidden people to aid ships in distress. Behind the latter accusation were several actions on the line separating salvage from piracy. One such event involved the Ark of Noy from Danzig which was stranded on the shore of Burrafirth (1592) and later seized and stripped of her sails by William Manson, the then Under-foud, after the crew failed to repair her. While incarcerated at Edinburgh Castle, Patrick appointed his illegitimate son Robert as his deputy in the earldom. His activities ended in an open rebellion against royal authority. Earl George Sinclair of Caithness came to the King's aid and the Stewart rebellion was quelled after a long siege of Kirkwall castle and by the work of a traitor working from the inside. Robert Stewart was convicted of treason and hanged in January 1615. Earl Patrick Stewart, by the open rebellion of his son, put himself beyond the mercy of his former friend and relative King James VI. He was found guilty of treason and subsequently beheaded on 6 February 1615. There was a contemporary suggestion that the execution had to be delayed for some days to allow him to learn the Lord's Prayer. This page was last modified on 17 October 2016, at 13:13.